Fantasy football is essentially the creation of your own personal NFL team. It scores fantasy points based on the individual stats of the players on your team each week. There are many different guidelines and variations to the game, but the principle remains the same: Your job as the fantasy owner is to draft, manage, and adjust your team in whatever ways your league allows that will net you more fantasy points each week than your opponents. Scoring and rules can vary from league to league, but generally speaking, you have to compile a team of NFL players that will score points every time they amass yards and touchdowns. The more points your team scores, the greater chance you have to be victorious. As you may already know, fantasy football can be played for money, with investments ranging anywhere from a few bucks to thousands of dollars. It can also be played just for bragging rights. Regardless of the monetary stakes for your league, fantasy football is a fun experience that brings together people from all walks of life. How Does Scoring Work in Fantasy Football? Sites often differentiate between point-per-reception (PPR) leagues and standard scoring leagues. PPR leagues used to be a rarity, but are now just as common as standard scoring leagues. You may see variations in scoring that include points for individual defensive players, special teams, tackles and just about everything else, but the system listed above is the most common. All league types and scoring systems are fun, and there’s no right or wrong league type, but be sure to know which kind of league you’re in before your draft, and be aware that many reference sources use the above scoring system for rankings and advice. Which NFL Players Will Be On Your Fantasy Team? Typically, a fantasy football league includes drafting somewhere between 16 and 20 players. Fantasy teams have starters and backups, just like real NFL teams do. Most leagues start 1 QB, 2 RBs, 2-3 WRs, 1 TE, 1 K, and 1 Team Defense. Most leagues nowadays also start 1 Flex, which can usually be filled by your choice of a RB, WR, or TE. With subtle variations, this is most likely the type of league you’ll be involved in. However, as all things do, fantasy football leagues have evolved over time into many different types. A common variation is an auction league, where players are auctioned off rather than drafted, with a pre-determined amount of money allowed for each owner to spend on their entire roster. If you’re in one of these leagues, check out the Auction Strategy 101 guide. Auction Instead of a draft, owners are given a salary cap to bid on players with. 2QB Owners designate not one, but two quarterbacks for their starting lineups each week. Best Ball/MFL10 Draft-only league where owners do not set lineups or make roster moves. Daily/DFS One week leagues where rather than a draft, owners are given a salary cap with which to make a lineup. Dynasty Owners can maintain their entire team from one season to the next. FAAB Same as a standard league but owners have a free agent acquisition budget for acquiring free agents. IDP League where individual defense players are drafted. Keeper Owners can keep a designated number of players from one season to the next. OFLEX Owners have the option to use a quarterback in their flex position. If you find yourself in any one of these non-traditional leagues, become a member at 4for4 and dominate! Subscribers have access to IDP rankings, auction league values, advice on keepers, customizable rankings, and much more. 4for4 specializes in every conceivable type of fantasy football, and will be able to help you win regardless of format. It’s worth noting that Daily Fantasy Sports (DFS) has become a huge part of fantasy football. DFS requires a completely different strategy than traditional seasonal leagues, and 4for4 has a completely separate subscription completely dedicated to being a profitable DFS player. For more information, see the DFS subscription page. Where Can I Play Fantasy Football? The vast majority of fantasy football is played at either ESPN.com, Yahoo.com, CBS.com, NFL.com, and MyFantasyLeague.com. If you’re new to fantasy football, you may want to start with one of these tried and true options. They generally have open leagues you can join or the option to create new leagues, either private or public, that can help you get started. The aforementioned sites are also great for customizable settings. Once you join or start a league, take some time looking through the league settings and getting yourself familiar with roster sizes, scoring systems, waiver rules, and other important factors to prepare you for an action-packed fantasy season. Play Fantasy Football Because It's Fun! While all fantasy sports bring a certain level of enjoyment to a person’s life, with fantasy football this is especially so. Since the NFL is structured in such a way that most of the games occur on one day of the week, and over a third of the regular season games are nationally televised, you'll have the opportunity to watch many of the players on your fantasy team score fantasy points for you live throughout the season if you so choose. Fantasy sports have invaded not only people’s personal lives, but families, work spaces, and friend circles, and its popularity is still growing tremendously. The Fantasy Sports Trade Association (FSTA) estimated that in 2015, 56.8 million people in the USA and Canada were playing fantasy sports. The FSTA states that number has grown from an estimated 500,000 players in 1988. Fantasy football can also be a way to bring people from all different walks of life together. No longer dominated by men, FSTA estimates that currently, 34 percent of players are women. 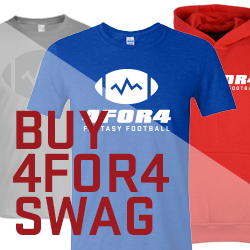 A subscription to 4for4.com provides you with everything you need when preparing for and engaging in fantasy football. With year-round, up-to-the-minute fantasy-relevant news, content, and rankings updated in real time, you can prepare for your draft and stay informed throughout the entire fantasy season. Drafting early? 4for4’s rankings come out in May, just weeks after the NFL Draft (4for4 has tons of content of incoming rookies as well). Your league extends all the way to the Super Bowl? 4for4 has you covered with the industry's most accurate weekly rankings, as well as player profiles from expert fantasy scouts, all the way up to the final game. If you want to be the best, you have to learn from the best. Rankings are put together by John Paulsen, the most accurate fantasy football expert in the business. John was named the Most Accurate Fantasy Football Expert by FantasyPros for both the 2010 and 2014 seasons, and was the runner-up in 2011. He also finished fourth in both 2012 and 2015. Accurately predicting the stats of NFL players is an essential but difficult task, so to find someone with the kind of consistent track record that John has with projecting player stats is astounding. Winning your fantasy league comes down to predicting which players will score the most fantasy points, and from 2010 to 2015, Fantasy Pros ranked 4for4 as the most accurate source for fantasy information out there! For more information on 4for4's incredible accuracy, please refer to the accuracy page. Also note that during the season, 4for4 tracks projection accuracy on a week-to-week basis and publish detailed comparisons of projections to actual player performance in the Forecast Accuracy Report. Once initial rankings are released. they are constantly updated in real time as things change throughout the offseason and into the season. There are many reasons to update rankings on a consistent basis -- injuries, roster moves, demotions, and promotions, to name a few. Players excel in camp and earn larger roles, quarterbacks develop better timing with receivers, schemes change to feature certain players more prominently than others, and so on. All these factors can lead to a change in how players should be ranked. The crux of fantasy football is analyzing stats and information to accurately rank players. Everyday, the 4for4 team mines through the data and news to consistently find new insights that help you win. For example, many novices (and some experts) may only be looking at stats from the previous season without fully considering the context. For example, say you're looking a WR's stats from last year (e.g. 27 catches, 453 yards, and 6 touchdowns) and determine that player is not a good fantasy option. 4for4 would point out that that over half of that production came in the last four games of the season when the WR came into an increased role that will continue in the current season. This changes things entirely. Keeping up with 4for4's rankings will help you to catch these potential oversights and find value in your draft so that your team is always one step ahead of everyone else's. 4for4 has many tools at your disposal to make the process of assembling the best team in your league easier. Average draft position (ADP) information is compiled in the Multi-Site ADP Tool so you can keep track of exactly when the players you want are getting drafted, and the Draft Day Bargains calculation enables you to beat your league mates to the punch at drafting the best players. 4for4 also has cheatsheets which have every player ranked by position and overall. Print off these cheatsheets, or simply keep them open in a window during your draft, and you'll avoiding scrambling for information at the last minute to decide who you should pick in the draft -- remember, you generally have one minute or less to make each pick. 4for4 creates these cheatsheets based on a proven, time-tested forecasting model to give you an inclusive, effective list of rankings for each position. It pays to diligently read headlines, check all news sources and generally know what's going on in the NFL. But who has 16 hours a day to do all the digging? 4for4 does! For starters, 4for4 has an e-mail service which updates you on all of the important the fantasy-relevant news and also the site's best content. It's easy to sign up and easy to opt out. This is a quick and effortless way to get quality information that will keep you up-to-date on fantasy-relevant news around the NFL. 4for4 also has a section dedicated specifically to NFL news. Check this section out on your lunch break or before you go to sleep to find out the latest happenings in the NFL. This allows you to stay up to date on current fantasy-related events, without having to go to multiple sites or pore over the Twitter accounts of every beat writer. The news section includes league news, team-specific news, and positional listings of what's happened recently with each NFL player. This is great if you're wondering if that rookie quarterback has signed, or how well that injured running back is recovering from surgery. Other news sections on the website include rookie reports, off-season movements, and more. With in-depth articles posted frequently on the website from some of the best writers and analysts in the industry, 4for4 also provides different perspectives on what's happening around the league and its fantasy relevance. This includes fantasy trends, overvalued (and undervalued) prospects, tips for drafting from specific positions, early camp reports, and much more. There are even sections for content on IDP leagues, and of course, daily fantasy. Reading up on the different sections can make you the most educated and prepared person in your draft room -- and all season long. Some new fantasy managers stop paying attention to their team after their draft. They prefer to watch for injuries and bye weeks and stick to the roster they chose and the starters they established. 4for4 does all the legwork for you here as well. Subscribers have access to a full section dedicated to schedule analysis (a.k.a. Hot Spots), which can help you plan who to draft for a committee or who to pick up on the waiver wire. You can identify which players on your team have the best matchups each week with 4for4's exclusive schedule adjusted fantasy points allowed (aFPA) metric. And if you’re still left wondering what decision you should make about a player, draft pick, or trade, 4for4 even has a Discuss Your Team Forum, where fantasy scouts and other members are available to answer your questions and engage in a little fantasy chatter. 4for4's team of experts love fantasy football and want to do everything possible to ensure you win your league!